From the John Hardy Legends Collection. Naga dragon head in bronze; black onyx eyes. Sterling silver mouth releases to grasp ring. Established in Bali in 1975, John Hardy is dedicated to the creation of ultimate beauty through artisan handcrafted jewelry. Each of John Hardy's distinctive collections conveys evocative symbolism and honors the transmission of creative energy from the artist to the wearer. Since inception, the company has been deeply rooted in the essential values of community, artisanship, and sustainability. 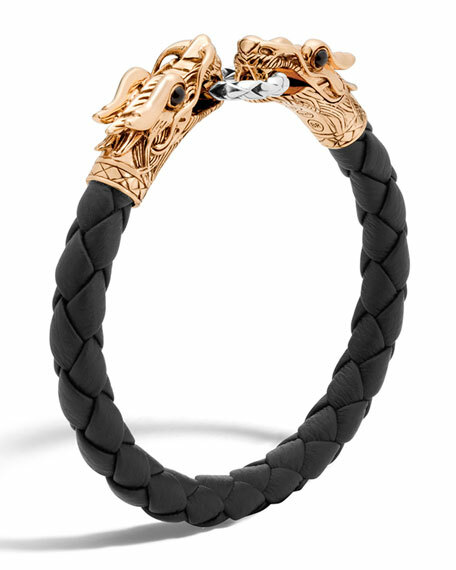 Alexander McQueen twin-skull bracelet. Inset embossed logo and snake details. Coated brass hardware. Open cuff. Slip-on style. Made in Italy. EXCLUSIVELY AT NEIMAN MARCUS Brace Humanity men's bracelet. Stingray shagreen cord. Silver-plated hook closure. 8"L x 0.3"W. Made in USA of imported material. Red Levanto marble bracelet by Emanuele Bicocchi. Sterling silver foxtail chain and hardware. Square red Levanto marble stones. Lobster clasp. Red Levanto marble bracelet by Emanuele Bicocchi. Sterling silver foxtail chain and hardware. Square red Levanto marble stones. Lobster clasp. Handmade in Italy.